Great Wee cottage highly recommended! We enjoyed our weeks stay in the Wee Nook, it was very well equipped and well heated. As we are walkers the cottage’s location was ideal for us as there are lots of marked trails around the Birnam/Dunkeld area with out the need of a car. Lovely little flat in a nice location. The flat was clean and had all facilities required along with cooking utensils etc. Great spot to explore the many walks, climbs, visitor attractions the area has to offer. Amazing little flat , loads to offer ! Rhoda was so accommodating and quick to reply to any of our questions. It was perfect. Highly recommended. Clean, comfortable flat. Heating had been left on for our arrival. It was very warm and cosy. We were self catering and I was impressed by the range of utensils, pots and dishes available. The Wee Nook is a lovely flat in Birnam. It’s within short walking distance of the train station and Birnam Arts Centre. It’s very clean and really well equipped – the hairdryer and cafetiere were much appreciated! The weather had just turned a bit colder so it was lovely to have the heating on on arrival. Unterkunft ist einfach klasse! Wir hatten alles was man braucht (incl. Infomaterial) und die Organisation war super einfach. Für unsere Ausflüge in die Cairngorms & St. Andrews war sie gut gelegen und Vorort kann man auch so einiges entdecken. Everything I wanted plus the bed was properly the most comfortable I have slept in away from home. Lots to do in the area. Very warm and cosy inside despite the snow and ice outside! A different walk from the doorstep everyday despite being in the middle of town with shop, bookshop, community centre, cafe and hotel bars a stone throw away. Great wee place for a few nights stay. Ideally located for easy access to surrounding areas. The Wee Nook was just perfect for us as a couple. Comfy sofas, very comfortable bed, well equipped kitchen and all sparkling clean. The location was perfect for us attending an event at the Birnam Institute. I wouldn’t hesitate to recommend staying here. I stayed in The Wee Nook over Christmas 2017, with my husband and dog. 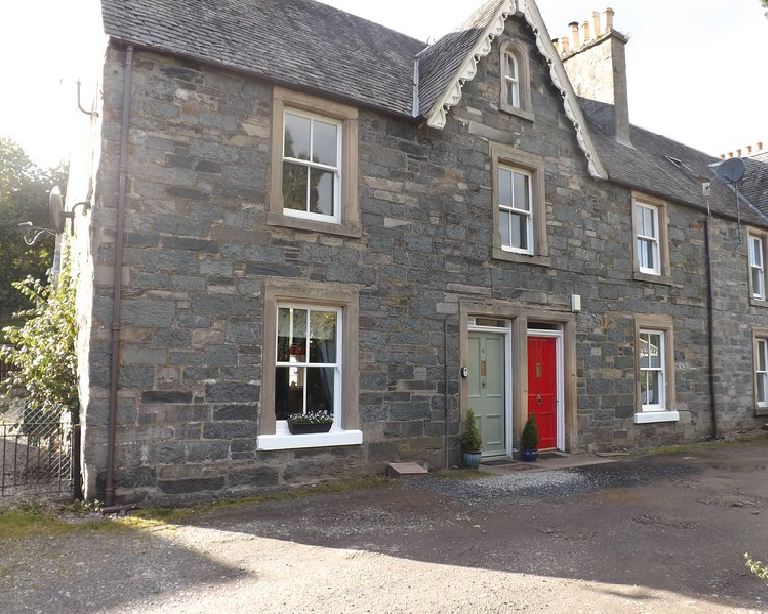 It is a lovely, cosy and clean apartment in a great setting, ideal for walks into Dunkeld. The kitchen was very well-equipped with everything we needed to cook a Christmas dinner, and the bed was large and extremely comfortable. Although it is a ground floor apartment, the walls are very thick and it was quiet and peaceful. There are fantastic walks in this beautiful part of the world, including The Hermitage and Atholl Woods. The pubs are very dog-friendly and our particular favourite was the Perth Arms in Dunkeld. We would definitely recommend the apartment and hope to return soon. The Wee Nook was a great place to stay. Cosy and comfortable base to explore the surrounding area. Especially liked the extra tasty treats on arrival. We will be back! The property was clean and well presented. It had a very well equipped kitchen and a really comfortable bed. Plenty of good walks around the area and nice bar near by. A lovely wee apartment, providing everything we needed for a great stay It was spotlessly clean and ideally located for a wander through the historical Birnam woods, for Dunked with its beautiful cathedral on the banks of the River Tay and some fab individual shops (my granddaughter loved Going Potty). Very central too for accessing other beauty spots, e.g. Aberfeldy, Pitlochry. We will definitely return next year. Great for 2, really cosy and well equipped. Very quiet area and only 10 minute walk to some good little eateries. This cottage has all you could need for a holiday stay. The welcome pack on arrival was a lovely touch.The cottage enjoys a lovely, quiet, settling yet only a minutes walk from the amenities of Birnam. I did 6 days of walking straight from the doorstep & with the train station being a few minutes walk away, ideal if not arriving by car. The place is very clean and the beds are comfortable. Linens and towels are just like hotels. Small but comfortable, the owner offered a bottle of wine and some shortbread, crisps in a welcome basket. It warmed our heart as we have arrived at night hungry and cold. Very calm area, a nice walk to the city centre of Dunkeld where there are nice restaurants and bars. Small, clean and well furnished in a good location. Comfy bed (Can’t talk about the sofa bed as our friends slept on that but they thought it was fine). Kitchen well equipped, Freesat telly and good wifi. Shower in bath was electric and ok. Bath has anto slip mat. Good breakfast at wee post office shop/cafe about 300 yards away on the main road. Lovely flat in a fantastic location. Thoroughly enjoyed our stay here. A well equipped and immaculately clean place very convenient to attractions in area. Views on beautiful garden, a profusion of colors in the too often grey Scottish climate. Highly recommended. The Wee Nook is exactly as described and in a wonderful location to explore the local area. We really appreciated the wonderfully comfortable king size bed and bed linen and a really well equipped kitchen. For those who like to remain connected, the wifi was totally reliable! A well appointed and well looked after cottage in a quiet cul de sac, with easy parking. Kitchen excellent, bathroom excellent and lounge very good. My only criticism is that the bedroom is very small – whilst that can’t be helped, the storage for clothes is poor. The wardrobe is chocker with other items and the door doesn’t close properly. My suggestion would be to rip out the old fashioned wardrobe and replace with an open unit which would make the room seem bigger and give better storage. Location very good – at the end of the road is the theatre and cultural centre, a lovely bookshop/coffee shop and the pub at the hotel isn’t bad either. Try the Braan Valley brewery 80/-! Bus to Perth, and other places handy. The station is difficult to find and has few trains stopping. Overall a very good all round place to stay. Fabulous location, a truly beautiful part of the world. The Wee Nook was just what we were looking for, quiet, clean and well equipped. We would highly recommend it. The nook was a lovely wee apartment close to all the amenities and lots of walks. My partner and I and our dog had a great break in Birnam and Dunkeld in a lovely flat that was in the centre for touring all of Perthshire or for staying in the local area which had plenty of places to eat and drink and the dog was always welcome. Clean, comfortable and cosy apartment. Everything needed for a relaxing and comfortable stay. We really enjoyed our stay in this lovely area. The apartment is tastefully furnished and warm. Very quiet street. Short walk to Birnam arts centre and a second hand bookshop with home made cakes. Great area for walks. Loved the hermitage. Enjoyed drinking in the Tay bank. Can recommend highland safaris, leisure pool in Perth, beach at Broughty ferry and discovery ship in Dundee. Very friendly and helpful owners. We had enough room in the apartment for four. Easy enough to operate the sofa bed. Single beds very good quality. Kitchen has all necessary equipment. Would definitely recommend this apartment and the area. Climb Birnam hill if you can. Also loved Stirling castle and pandas at Edinburgh zoo. Very cosy apartment with everything you could need, set in the lovely surroundings of Dunkeld and Birnam. Alexandra was very helpful, giving us travel advice when stuck. Will definitely be back! Maison de village refaite à neuf avec tout le confort. Literie de qualité. La maison est calme et très bien situé dans une très belle campagne. Le wifi est excellent Très bon souvenir de notre passage. Merci à vous!